As we explained a couple of weeks ago, the Office of Legislative Legal Services is responsible not only for writing bills and amendments, but also for publishing the statutes. But these functions—drafting and publishing—have not always been housed in the same office or even in the same branch of government. The history of publishing statutes in Colorado is long and complicated. Starting in 1861, the Territorial Legislature published the session laws after each biennial legislative session, which contained all of the bills the Legislature passed. Until 1868, if someone wanted to amend a bill that passed in an earlier session, he had to amend the bill as it appeared in the session laws. The General Assembly voted to reconsolidate and republish the laws at various times: The General Laws of 1877; the General Statutes of 1883; Mills’ Annotated Statutes of 1891; the Revised Statutes of 1908; the Compiled Laws of 1921; and the Colorado Statutes Annotated of 1935. Each of these, except the Mills’ Annotated Statutes, was created with the General Assembly’s official authorization, but there was not a specific official or office that was consistently responsible for codifying and republishing Colorado’s laws on a regular basis. That year, the General Assembly adopted House Bill No. 201. Like earlier acts, this act provided for revising and codifying the laws of the state, but with this act, the General Assembly for the first time took a longer view. It created the Committee on Statute Revision within the Judicial Department, chaired by the Chief Justice of the Colorado Supreme Court. The committee consisted of the Attorney General, two Senators, and two Representatives. The act also created the position of Revisor of Statutes. The act directed the Committee to appoint an attorney to this position and to oversee his work. The Revisor could hire attorney associates and clerical staff to assist him in collating, compiling, editing, and preparing the statutes; publishing the statutes and other important documents like the state and federal constitutions; and creating source notes, annotations, an index, and comparative tables of prior compilations. All of this work was to be completed and submitted to the General Assembly by the 1953 legislative session. H.B. No. 201 also directed the Revisor, at the end of each legislative session after 1953, to annotate, arrange, and prepare pocket parts or supplements for the 1953 revision of the statutes. The Office of the Revisor of Statutes was now a continuing enterprise, responsible for maintaining the accuracy of the published statutes on an annual basis. The General Assembly also directed the Revisor to assist the Legislative Reference Bureau (in the Attorney General’s Office) in drafting bills and amendments and engrossing and enrolling bills. Finally, a permanent process existed to ensure the published statutes kept up to date. But in 1958, 1959, and 1960, the office fell behind in publishing the pocket parts. So, in 1961, the General Assembly directed the Revisor of Statutes to publish a new recodification, incorporating all of the changes since 1953 into a single set of volumes: the Colorado Revised Statutes 1963. At this time, the Revisor was still working out of the judicial branch. In the mid-1960’s, the General Assembly undertook a study of the organization of Colorado’s state government. In 1968, it passed Senate Bill No. 1, concerning the administrative reorganization of state government, which completely reorganized the executive branch of government, and moved the Legislative Drafting Office (LDO) from the Attorney General’s Office to the legislative branch. Then, in 1969, the General Assembly passed Senate Bill No. 396, which created the Office of Revisor of Statutes (ORS) in the legislative branch. Both the LDO and the ORS were under the direction of the Committee on Legal Services. Finally, in 1988, the General Assembly passed House Bill No. 1329, which combined the LDO and the ORS into the Office of Legislative Legal Services (OLLS). In combining the offices, the General Assembly named the Director of the OLLS the ex officio Revisor of Statutes, although the Director was authorized to appoint another attorney to serve as the Revisor. This has been the Director’s practice since 1988. The current Revisor of Statutes, Jennifer Gilroy, was appointed March 26, 2004, and is the first woman to serve in this capacity. The Revisor’s duties have not changed significantly over time. 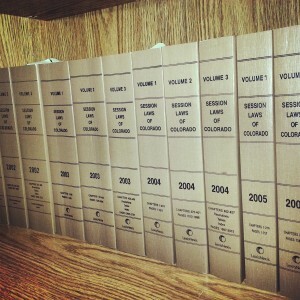 Under the direction of the Committee on Legal Services, the Revisor must compile, edit, arrange, and prepare for publication the Colorado statutes, the state and federal constitutions, other significant documents, an index of the statutes, and tables comparing the current statutes with previous compilations. Each section of the statutes must have a source note, which provides the history of the section, and annotations of any cases interpreting the section. In publishing the statutes each year, the Revisor, with assistance from legislative editors and attorneys in the OLLS, can correct errors in grammar and punctuation, and may identify other errors or inconsistencies that may be fixed in a revisor’s bill introduced in the next legislative session. The most important recent changes to the published statutes are a result of technology. In addition to publishing the entire set of statutes each year, the Revisor oversees the electronic publication of and access to the Colorado Revised Statutes on the internet, on disc, and through e-books. The last time the General Assembly recodified and reorganized the entire Colorado Revised Statutes was in 1973. With that recodification, it adopted a numbering convention that provides a great deal of flexibility and room for expansion in the statutes. In the last legislative session, the General Assembly recreated the Statutory Revision Committee to address defects and anachronisms in the law. These provisions make another complete recodification of the statutes less likely. [i] See “Colorado Statutes: Past, Present, and Future” J. Myron Jacobstein, 33 Rocky Mountain Law Review, pg 36 (1960-61). Previous Post: 2017 Bill Request Deadlines Quickly Approaching!